Labour Party leader Ed Miliband has ruled out forming a coalition with the Scottish National Party (SNP) after May’s general election to quash Tory warnings that a Labour government would collaborate with a party advocating the break-up of the UK. Speaking in Pudsey, Yorkshire, Miliband said there would be no SNP ministers in a government led by him, in response to Prime Minister David Cameron’s claim the Labour leader was mounting a “despicable” plan to gain power by courting nationalists. “Labour will not go into coalition government with the SNP. There will be no SNP ministers in any government I lead,” said Miliband. Just minutes after making the claim, both the SNP and the Conservatives said Miliband’s words were worthless, as he had not ruled out an informal deal with the party. Scottish First Minister and SNP leader Nicola Sturgeon said Labour and the SNP could still work together to keep the Tories out of power. “Ed Miliband will not rule out a deal with the SNP because he knows it’s impossible to become prime minister without being carried into Downing Street in Alex Salmond’s pocket,” the spokesperson said. Miliband accused the Tories of using scare tactics. “The Tories, the party that haven’t won a majority for over 20 years, are now running a misleading campaign based on the idea of a Labour-SNP coalition. As I said on Thursday night, this idea is nonsense. 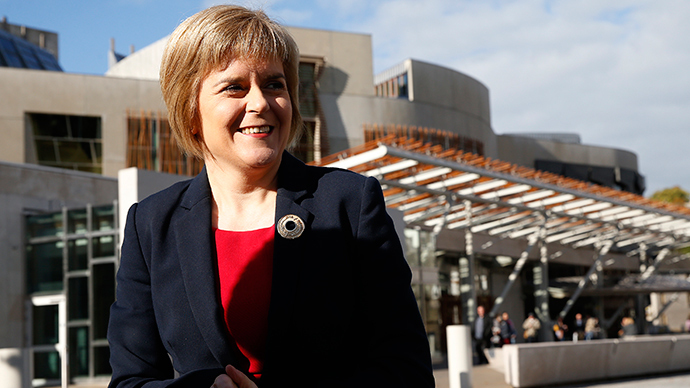 Miliband’s comments come as Sturgeon asserted the SNP’s ability to cooperate with the other parties. Speaking to an audience at the London School of Economics (LSE), Sturgeon praised her party for its ability to win favor with other political heavyweights, and campaigned for an overhaul of archaic Westminster protocol. “At different times we won support from Labour on increasing apprenticeships; from the Greens on a home insulation scheme; from the Tories on regenerating town centers; and from the Liberal Democrats on college bursaries,” she said. “It involved a process of building consensus across a whole parliament – not just forcing decisions through using the power of the party whip,” she said. Her speech came two days before Chancellor George Osborne’s final budget before the general election. Sturgeon used her speech to call for a radical rethink of the nation’s finances, calling for increased openness and fairer wages.